US POLICE HAVE said they’ll examine what appears to be the extremist ideology of an Oregon man accused of fatally stabbing two men who tried to intervene when the suspect yelled racial slurs at two young women who appeared to be Muslim on a Portland light-rail train. The attack on Friday happened on the first day of Ramadan, the holiest time of the year for Muslims, and it sent shockwaves through a city that prides itself on its tolerance and liberal views. A memorial where the stabbing occurred grew steadily yesterday, and a vigil was planned. “That people feel emboldened to come out and show their racism and bigotry in that way is horrifying to me. 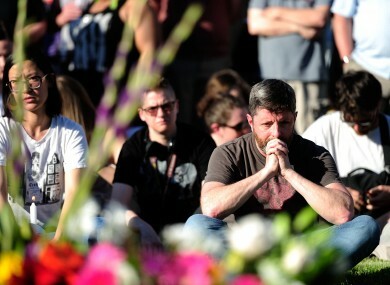 It’s a gut check for everywhere — and absolutely for Portland,” said Christopher Douglas, who stopped at the memorial. Portland … floats in a little bit of a bubble of its own liberal comfort and I think the reality is sinking in. He will make a first court appearance on Tuesday, and it wasn’t clear if he had an attorney. A phone at his home in Portland rang unanswered yesterday, and no one came to the door at his parents’ home. Meche’s mother, Asha Deliverance of Ashland, Oregon, confirmed on Facebook that her son had been killed. She did not immediately return a call to her business phone listing or a message sent through social media. Meche graduated last year from Reed College in Portland with a bachelor’s degree in economics, the college said on its website. Mayor Ted Wheeler said at a news conference that Best was an Army veteran and a city employee. These two men died heroes as a result of a horrific act of racist violence. “Their actions were brave and selfless and should serve as an example, an inspiration to us all. They are heroes,” Wheeler said. Police said one of the two young women on the train was wearing a hijab. The assailant was ranting on many topics, using “hate speech or biased language,” police Sgt. Pete Simpson said. The FBI and US Attorney for Oregon are working with Portland police. The FBI says it’s too early to say whether the slayings qualify as a federal hate crime however Christian faces intimidation charges, the state equivalent of a hate crime. The Portland Mercury, one of the city’s alternative weeklies, posted an article on its website saying Christian showed up at a free speech march in late April with a baseball bat to confront protesters and the bat was confiscated by police. The article included video clips of a man wearing a metal chain around his neck and draped in an American flag shouting “I’m a nihilist! This is my safe place!” as protesters crowd around him. The Oregonian/OregonLive also had video from the 29 April march showing Christian. “I’ll remember this case forever because it made no sense,” he told The AP in a phone interview. Email “'They died as heroes': Tributes for men killed after intervening in racist incident on a train”. Feedback on “'They died as heroes': Tributes for men killed after intervening in racist incident on a train”.